Cebu's tropical secluded islands... be still! Peace of mind, away from hassles, FREE from noise and distractions. Is that what you need right now? 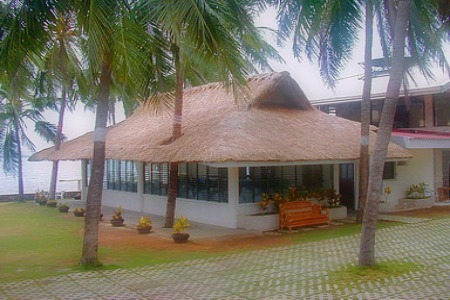 Then you need to be at any of Cebu's white secluded islands' amazing tropical spot. There are marvelous places here that allow you to be left alone and be just yourself. Right in one of these secluded places, you don't need luxurious facilities or distracting technologies. You only need to be on a particular spot of white sand and just dream away! The Camotes Groups of Islands is comprised of four islands and three sub-islands, making them more attractive with their various topography & environments. Beaches: beautiful white beaches everywhere you look - especially Borromeo Beach, Santiago Bay Beach Resort, etc. In this stunningly beautiful island, you have lots of choices for accommodations nearby the beach with affordable prices. Never miss this one among the various and unique secluded islands in Cebu Province. Put it on top of your lists, at least, it will keep you going especially when life is tough and you dreamed of going somewhere that offers what you exactly need most! So, explore its natural beauty, thread its white sand, embrace and be embraced its crystal waters. Being not so "developed" island, it is secluded, quite, peaceful... Although the island has been hit severely by storm, it is fast recovering and serving seriously more than ever its guests (update info, 2014 January). A famous person of the island has positively contributed is worth the mention - Vaughn Brady. He was a sky diver, entrepreneur, world traveler, creator of the island's Hard Rock Kafe 7 Kiwi Cottages in Santa Fe. A website (by PJames) that especially mentions this man is replete with information about everything of the island. So... Don't miss to check it out! http://wowbantayan.com/wowhome/. Although Bantayan Island is very tranquil and laid-back, it's also the place where you can do almost all active water sports. 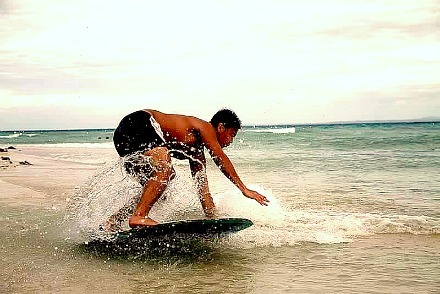 One of such sports is skim-boarding. 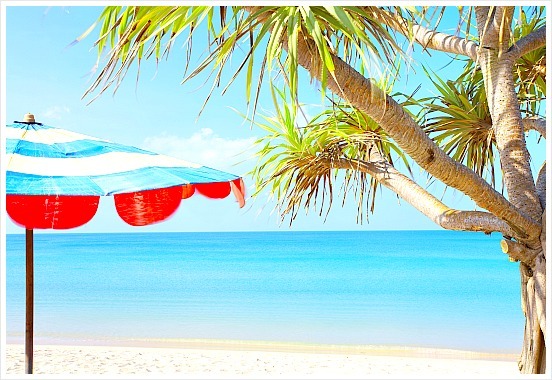 CLICK the link for more Bantayan Island Beaches & Resorts. 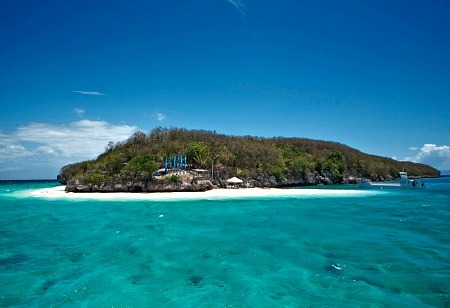 Sumilon Island is one of Cebu secluded islands' popular destination with white sandy beaches and blue waters. Aren't you convinced yet? I believe you are already thrilled to visit and dreaming to be there soon (and so I am especially when you are setting in front of your computer doing the same chores!) You can find out more about this famous island in the southern part of the province by just clicking their official website. See further details of this island here: sumilonbluewater.com.ph. A secluded beach resort with excellent accommodations, peace, and quite as well as well-maintained and clean surroundings. Yes, that is what everyone who have been there would definitely say about Warrens'. Great Recreations: Volleyball court; Badminton court; Children's playground, billiards, darts, chess, table tennis, half basketball court, horseshoe game, etc. This could be your place of peace and rejuvenation. At least, you should do this once in your lifetime (or once a year, if you insist)! Check out for more details Warrens Beach's official website. Make sure you click that link to find all sorts of resorts and attraction in Cebu Province. Wishing you'll find the place you've been searching for. Please, visit more Cebu secluded islands for adventure and relaxation. Thanks a lot for visiting and reading through this page! You are most welcome to come by again or more often to discover more Cebu secluded islands & travel destinations, vacation, leisure or business, and events or celebrations facilities right on the beach. Have a sea of fun and enjoy the rest of your day! Have A Great Story About Cebu Secluded Islands? Please, share your Cebu or other secluded island stories. Let your friends, family, colleagues, and the whole world know your one and only interesting story! This popular site guides the international traveler and local holiday maker in discovering affordable and truly memorable vacations in Sunny South Africa. It also gives business people in the hospitality industry the opportunity to become much more visible to the online market.